This post briefly sums up the past few months’ revelations about LBWF councillors and their register of interests forms (grouping the findings under three broad headings) and then discuses some of the issues that arise. As earlier posts have noted, LBWF Director of Governance and Law, Mark Hynes, has determined that Cllrs. Limbajee, Miller, and Mbachu did not updated their registers of interests as required (see links below). ‘You were quite in your assertion that Cllr. Khan’s register had not been updated by him and that it still referred to the fact that he worked for Lloyds Bank whereas in fact he had ceased working for the bank. As you are aware this has now been corrected to reflect he is a self-employed financial broker. He has apologised for the oversight and I am satisfied that it was not a wilful act on his part to mislead anyone’. ‘The name of anyone who has provided sponsorship to me by making any payment in respect of my election or any expenses incurred by me in carrying out my duties as a councillor, other than those I have received from a registered political party’. Each of the three councillors declared to the Electoral Commission that they had received £167 from OMG Ltd. Strictly speaking for the purposes of the Register of Interest OMG Ltd have not provided sponsorship to the councillor by making any payment of money in respect of any election expenses incurred. What they have provided is a free service in producing a promotional video. Nonetheless having discussed matters at length with the Chief Whip Steve Terry we feel that in the interest of openness and transparency the payment should be included, even if technically it could be argued that there is no legal requirement to do so. Accordingly the register of interests will be updated to refer to this notional payment even though no actual money was paid to OMG by the member for the services provided nor has any money been received from OMG towards election expenses’ [emphasis in the original]. Cllr. Lyons declared to the Electoral Commission that he had received £50 from Unite. ‘The register has been updated to reflect this donation. Cllr. Lyons assumed that the returns made by his agent for the purposes of the Electoral Commission were sufficient and has apologised for the oversight’. Cllr. Terry declared to the Electoral Commission that he had received £168 from Cllr. Paul Douglas. ‘My understanding is that Paul Douglas paid the total cost for a local distributor to leaflet drop which was to be split between the three ward colleagues including Paul, Cllr. Terry and Cllr. Mitchell…[the figure reported to the Electoral Commission] is the repayment of a shared expense incurred by Cllr. Douglas and therefore does not need to be declared’. A comprehensive analysis earlier this year showed that ten councillors – including Cllr. Terry – had publicly posted register of interest forms that stood out from the rest because they lacked section nine, which reads ‘I ALSO GIVE notice of the following non-pecuniary interests’. Following a complaint about this, Mr. Hynes has concluded that none were at fault. He points out that when he was appointed to the job, there was no obligation to declare non-pecuniary interests, but from September 2017 he has been ‘inviting’ councillors to do so, and has amended the form so that they can. However, he adds, this process has been phased, with long-standing councillors only transferring to the new form when they have reason to update as a whole (that is, when their interests as documented in sections one to eight change). This is plausible, needless to say, though it is interesting to note that, for example, Cllr. Terry posted an updated form on 18 October 2018 which now includes section nine, though in other ways is remarkably similar to its predecessor, first posted on 19 June 2014 – strongly implying that Mr. Hynes’ phased process is in fact something of a moveable feast. As has been pointed out previously, Mr. Hynes possesses relatively few powers in relation to enforcing the rules around the registers of interests, not least because the bar for legal action is high. His only real tool, therefore, is persuasion. However, that said, his propensity to conclude that councillors’ non-compliance stems from wholly innocent error remains puzzling. The rules about the register of interests are well known, and are – with one exception, explored in the following paragraph – clearly stated. Moreover, as Mr. Hynes himself has emphasised, he is on-hand to give advice. In early 2018, Cllr. Limbajee declared that he was working for the Labour Party, while Cllr. Kahn claimed to be at Lloyds bank, information that was respectively four years and nearly two years out of date, and thus misled the public about the two councillors’ employment status. Was their failure to update just forgetfulness? Did carelessness, perhaps even unacceptable carelessness, really play no part? And ultimately, doesn’t Mr. Hynes reluctance to point the finger – even accepting that sanctions are very unlikely to follow – undermine public confidence that LBWF is determined to get this issue right? As already noted, LBWF argues that prior to Mr. Hynes relatively recent intervention, councillors did not have to declare non-pecuniary interests on their forms. It bases this on the contents of an appendix to the councillors’ code of conduct that was allegedly adopted at a full council meeting in October 2012. However, exactly what was agreed on this occasion is in fact less certain than might be imagined. The appendix in question contains a number of crossing-outs, while the passage specifically about non-pecuniary interests is in blue and red ink, rather than the customary black (see below), suggesting that it is in draft form. In addition, the wording of the appendix, too, is ambiguous, and legitimately can be understood in different ways. Little wonder that a very senior LBWF manager recently conceded that the council’s presentation of this information ‘could be confusing’, and so was in need of clarification. 3. Councillors using their own money to pay for election expenses. As has been indicated, Mr. Hynes asserts that councillors who pay election expenses out of their own pockets do not need to declare the fact on their register of interests forms. Mr. Hynes may be right in terms of the letter of the relevant wording, but whether he is in tune with its spirit is again questionable. Views will differ about self-financing, but if it happens, it must surely be out in the open, so that voters can see who is wealthy enough to commit their own money, as well as be in a position to ask about the origins of the funding, and thus ensure that this is not a way of massaging third-party donations. Of course, Mr. Hynes may retort that self-financing can be discerned from the returns made to the Electoral Commission. But in reality this is no guarantee of transparency because (a) the Electoral Commission does not publish the forms, only file them; and (b) though LBWF retains the forms in paper format, and allows them to be viewed at the Town Hall, it only does so for the three months after an election. So this is an issue that Mr. Hynes needs to address, and the way to do it is clearly to ensure that the wording on the register of interests forms stipulates that self-financing must be declared. 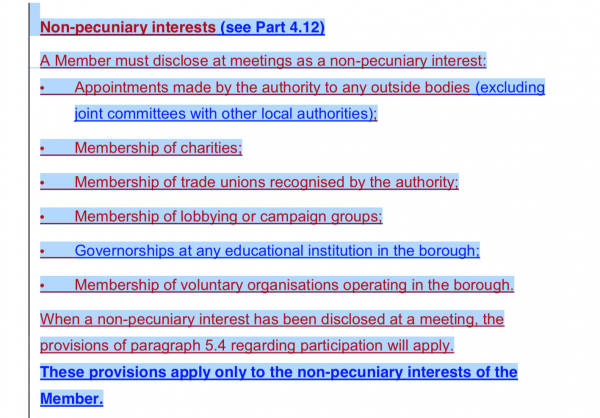 As the preceding paragraphs have demonstrated, though all councillors have a legal duty to declare their interests, a surprising number seem not to care, only facing up to their responsibilities when their ‘oversights’ become public knowledge. The fact that it apparently took lengthy discussions with Labour Chief Whip Steve Terry to persuade him that the OMG Ltd. subsidisation of three councillors at the last election should be declared on the forms is very revealing, and will no doubt surprise most residents. It is surely high time that LBWF began to encourage a culture where openness and transparency are the default positions, and it is to be hoped that the decent members of both main political parties will now campaign for this change, and with some energy.